San Diego, CA – A newly-developed technology at the University of California- San Diego called microfish will one day allow for tiny 3D-printed “smart” microbots to travel through a person’s bloodstream and deliver drugs to specific places in the body, as well as sense and remove toxins. The high-tech fish are extremely small, smaller than the width of a human hair. The revolutionary devices are extremely easy to create, but are remarkably high tech, with the ability to act as both a toxin sensing and detoxifying robot, according to researchers at UC-San Diego. “We have developed an entirely new method to engineer nature-inspired microscopic swimmers that have complex geometric structures and are smaller than the width of a human hair. With this method, we can easily integrate different functions inside these tiny robotic swimmers for a broad spectrum of applications,” said the co-first author Wei Zhu, a nanoengineering Ph.D. student at UC San Diego. 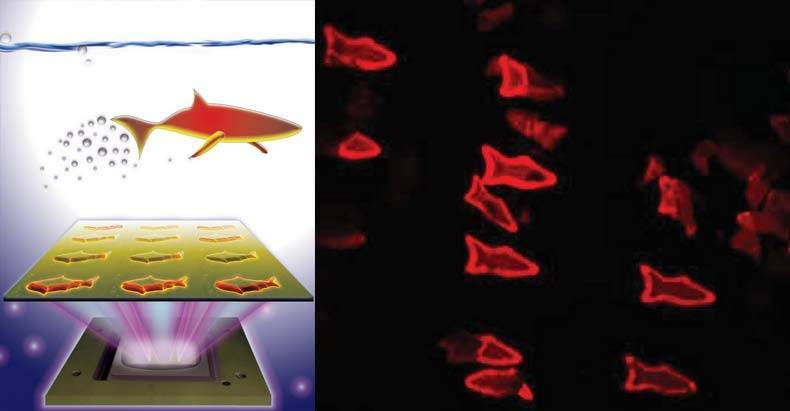 Researchers used a high-resolution 3-D printing technology called microscale continuous optical printing to create the microfish. The custom computer-aided design (CAD) program used could allow researchers to experiment with other shapes, such as sharks or birds, in the future. The microfish have platinum nanoparticles in their tails which, when placed in a solution with hydrogen peroxide, undergo a chemical reaction to propel them forward. They’re magnetically steered by way of iron oxide nanoparticle in their heads. When the microfish are placed in a toxin-rich environment, they become fluorescent red and begin to glow intensely as their toxin-neutralizing nanoparticles chemically bind with the molecules of toxins. “Another exciting possibility we could explore is to encapsulate medicines inside the microfish and use them for directed drug delivery,” Jinxing Li, the other co-first author of the study, said in a statement. Researchers believe that the realization of the microfish, as proof of concept, will usher in an entire new generation in “smart” nanobots.